Trust obstacle course: Girl Scouts are courageous and strong and can trust their sister Girl Scouts no matter what. In this challenge, the men had to trust their girls to navigate them through an obstacle course while blindfolded. Archery: Girl Scouts build their archery skills and challenge themselves while earning the Archery badge. In this challenge, men were put to the test to see who could get closest to the bullseye. Gaga Ball: While earning the Fair Play badge, Girl Scouts learn that following the rules of a game and including everyone is important. 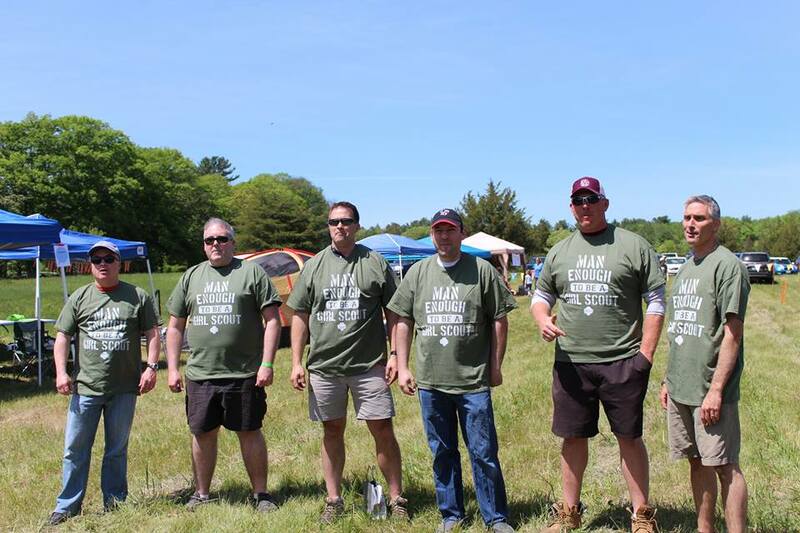 While playing Gaga Ball—a Millis encampment favorite—the dads had to follow the rules of the game to be the last man standing. The competitors received thunderous applause and encouragement from the 124 girls in attendance. More girls said they wanted their dads to participate next time, and everyone agreed that this needs to be an annual event. Thank you to all who participated in the first ever Millis Man Enough to be a Girl Scout challenge, and to all dads of Girl Scouts for being man enough to be a Girl Scout!